In Buddhism, we have a practice called “dedicating the merit” in which we offer up the “merit” or positive outcomes accumulated from any practice for the benefit of all sentient beings. Sat Nam Foundation reached out to the sacred chant artists that Spirit Voyage has worked with for so many years to donate their time and music to help us with this new project. We are now asking you to join with us. 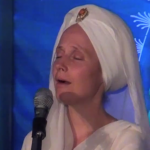 Don’t miss these awesome music videos by some of the most inspiring kirtan musicians in the world. The show is also about the spirit of creativity, as Harnam is committed to helping others develop their own creative strengths. By the time I’d listened to all 7 tracks I realized that they all can’t be my favorite—so I immediately replayed the entire CD from the start.